While a chef is generally constrained only by his or her creativity, throwing together ingredients and experimenting with pinches of this and splashes of that, a baker’s art is somewhat restricted by the confines of science: a cake will only rise with the right ratio of fat, sugar and flour; accuracy is key; and following a recipe to the word is important to achieve the right results. Of course baking can still be creative, and cooking is full of scientific detail, but moving seamlessly from one to the other is not always as simple as it might seem. Ottolenghi is one of those admirable chefs who manages to make the move effortlessly. His wonderful London cafes and restaurants are testament to this, with the menu moving from crusty sourdough and flaky, buttery pastries in the morning, through platters of stunning salads piled sky high and studded with jewel-like pomegranates or other exotic additions, to expertly and surprisingly seasoned meat and fish dishes, incredible vegetables, pillows of the most perfectly crunchy, chewy middled-meringues I’ve ever tasted and rich, deliciously decadent desserts. So, too, is Ottolenghi’s first cookbook, a mouthwatering adventure in three parts: Vegetables, Pulses and Grains; Meat and Fish; Baking and Patisserie. With a whole third of the book devoted to all things baked and sweet, this is a chef who knows his stuff; who can transfer the instinct and imagination of his savoury dishes into amazing sweet treats; who hasn’t simply ended his book with the standard chocolate fondant or crème brûlée that is sadly so often seen padding out the back of less imaginative recipe books. Ottolenghi is the first to admit that these delicious treats don’t always come easy, making no bones about the fact that baking can be a difficult and time consuming process: ‘Cakes and pastries can sometimes go horribly wrong, they are almost impossible to resurrect and they do take time to prepare’ being the opening gambit of his introductory chapter. However, after this somewhat brutal honesty, he then goes on to say that ‘the gratification of good baking is unbeatable‘ and that he and his team ‘desperately encourage any person who loves breads, cakes and sweets to try to make them at home’. This time I actually allowed my brownies to set before slicing! 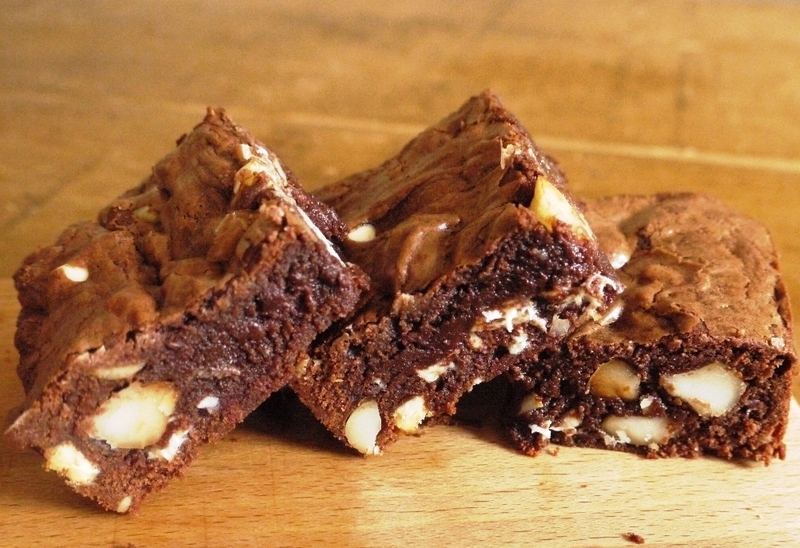 And I would desperately encourage you to make these brownies. 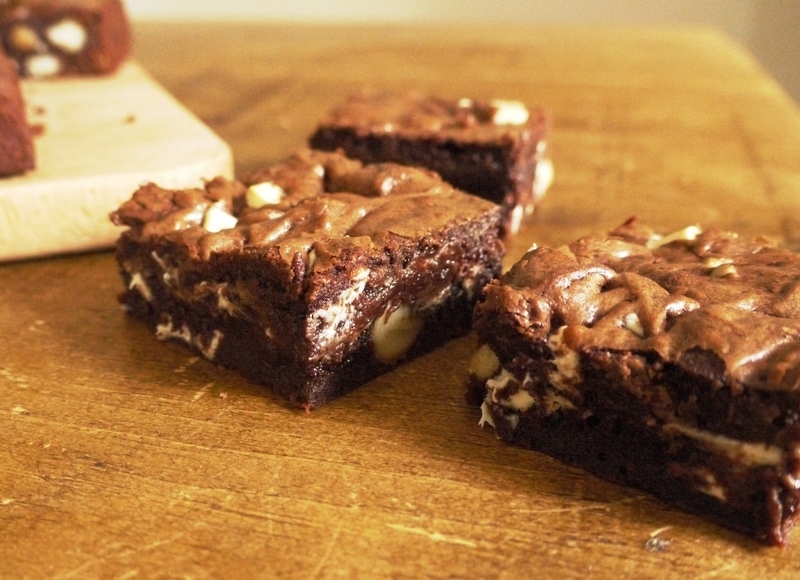 Adapted only ever so slightly from a wonderful recipe in Ottolenghi’s book, they are everything a brownie should be – rich and dark, firm yet moist, shiny-crusted, chewy-middled and full of chocolaty flavour. Toasted macadamia nuts add texture and a slightly salty, nutty tang to the velvet-smooth, sweet chocolate base, while accents of chunked white chocolate melt in your mouth with every bite. I’m constantly searching to find the perfect chocolate brownie recipe as the seven or so recipes listed on this blog will attest, and while I’m loathe to ever call it a day in the search for perfection, this is about as close as I think I’m ever going to get. Served warm with a cold scoop of rich vanilla ice cream puddling on its surface, this brownie might just be my idea of pudding heaven. The more eagle-eyed amongst you may notice that the edges of each brownie square are actually fairly neat. In this recent post, I claimed an inability to wait for pans of brownies to cool, resulting in scraggy edges and still molten middles exploding widthways before the chocolate has had a chance to set. However this particular batch was made to take to an event and I wanted to make sure that they both looked appealing and didn’t all stick together/fall apart during the transport process, so I did what any sensible adult would do and waited for them to cool slightly. It was a sheer test of willpower. But, as the old English (and adopted by Guinness) phrase goes, ‘Good things come to those who wait‘. 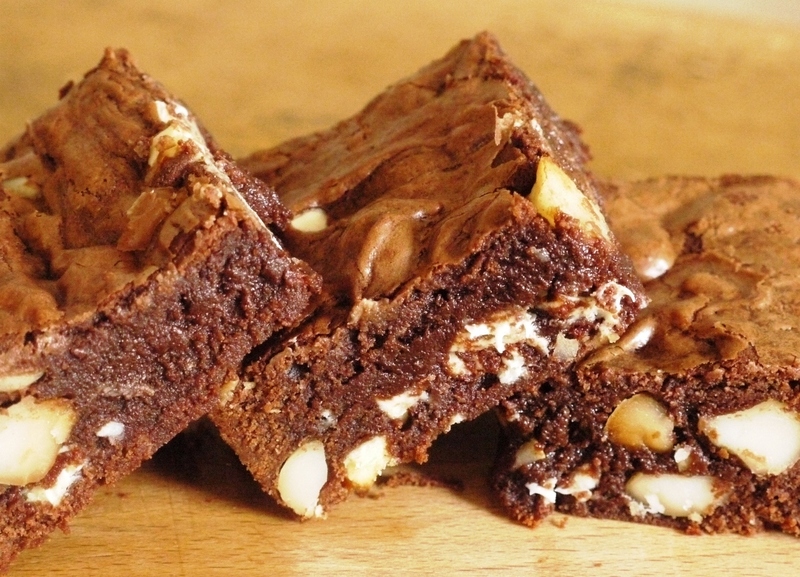 And these brownies are definitely a good thing. Preheat the oven to 170 degrees C. Grease and line a 23cm square tin. Spread the nuts evenly on a baking tray and roast in the oven for 4-5 minutes until a lovely nutty aroma fills the kitchen. Remove and allow to cool, before chopping coarsely. Melt the butter and chocolate in a heatproof bowl over a saucepan of simmering water. Remove as soon as the mixture is melted – you don’t want it to get too hot – and allow to cool slightly. Whisk together the eggs, golden caster sugar vanilla gently, taking care not to overmix – you don’t need to incorporate any air if you want rich, dense brownies. Fold in the cooled, melted chocolate then sift in the flour and salt, folding to combine. Fold in the toasted nuts and chopped white chocolate then scrape into your prepared tin and bake for 20 minutes or so, checking the pan after about 15 as brownies are always much better slightly under than over baked. Remove from the oven and allow to cool before slicing (if you can wait that long!). Interesting…these brownies have a lot more flour in than most recipes I’ve seen but the texture looks absolutely spot in. I’ll definitely have to give this recipe a go, not least because white chocolate chips are my weakness! I agree, the gratification of good baking is so resoundingly good, it’s addictive! I have both Ottolenghi books and you are right, he is a phenomenal chef. You can rest assured I will be trying this recipe, and soon! Kathryn – I wondered about all that flour too but I think there’s so much chocolate that it all balances out. The texture of these is gorgeous. this sounds amazing and looks so fresh! Love the texture of the top and that the middle looks gooey good. Perhaps the perfect brownie? I’ll try it and find out…Thanks! Get away, Loaf! They look TOO good. 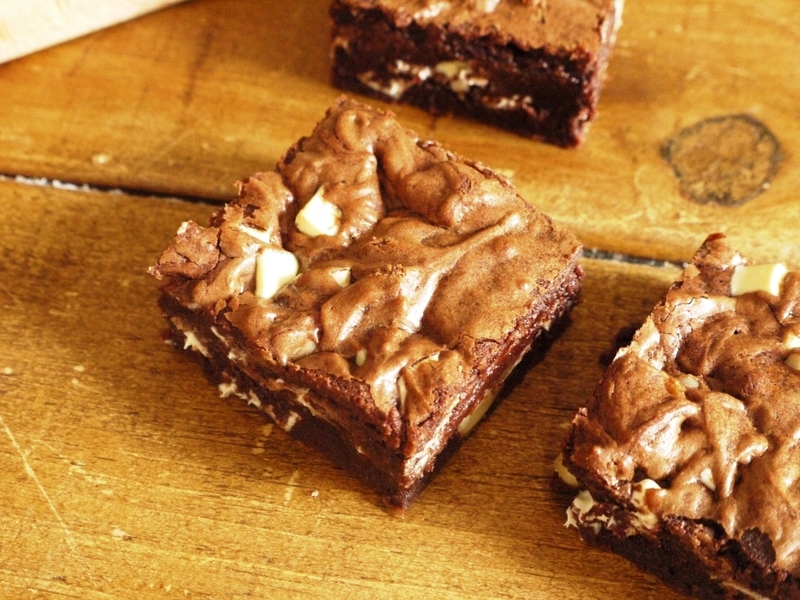 I’m loving brownies right now – I may have to do yet another recipe next week. Lovely stuff! I do love brownies, my favourite is one with cheesecake on. Macadamias are so good, I’ve been making loads of stuff with toasted nuts in recently! This recipe looks amazing, and I am looking forward to trying it out – I am also a big fan of Ottolenghi. Marissa – give them a go and see! Frugal Feeding – it’s all about the brownies. Lay The Table – I know, I’m slightly obsessed with toasting nuts and adding them to stuff at the moment, so good! Ellie – ooh, how odd, I’ve never had trouble finding them. I get mine from Waitrose – maybe try there? These look ridiculously amazing. RIDICULOUS! I may have told you before that brownies aren’t my favourite way to cook with chocolate but I totally get the idea of how good these must be and you have captured that lovely texture so well! I couldn’t agree more about Ottolenghi being one of those chefs who can actually bake. Often in restaurants & hotels the chefs stick to the savoury sections and the pastry is run by those who want to stick in that section. The two paths don’t necessarily cross. That’s why he is such a multi talented guy! Coming from Ottolenghi through your site these are surely worth every bite! OMG these look like pure perfection! How did you know white choclate, macadamia, and from below, pistachios, are three of my favorite baking add-ins? I used to devour bags of Mrs. Fields white chocolate macadamia cookies. These remind me of them, but love that you incorporated them into a brownie. I also adore your chocolate honeycomb semi-freddo. I need to try so many of your recipes! Kerry – haha, thank you! Laura – you have – you also said you don’t like chocolate fondants which I adore but each to their own! 🙂 And yes, Ottolenghi is fab. Paula – ah, thank you! Nic – you said it! Lisa – sixth sense 🙂 enjoy! I love Ottolenghi and this is another wonderful recipe. 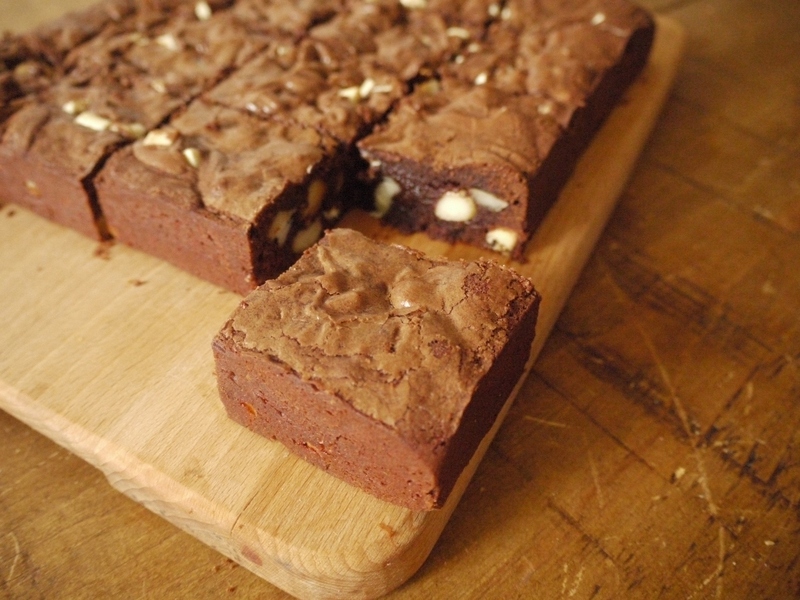 It looks like it was suitably gooey as a good brownie should be too…. wish I could have one of these! it looks so chocolatey delicious! Linda – make a batch, they’re so easy! These look divine. I love macadamia with chocolate. Yum! This looks INCREDIBLE. You have inspired me to become a pig this Memorial Day Weekend, I have all the ingredients, I may bake this. I know my husband will be so happy! Gorgeous photos! Working London Mummy – it’s such a good combo! Honey What’s Cooking – thank you, do let me know how you get on if you make them! 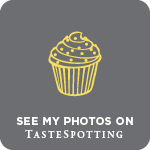 Thanks for posting this – I’m trying to recreate the hazelnut brownie from ottolenghi shops so have swapped out the macademias for hazelnuts and the white chocolate for praline seashells. Rather excited!! !